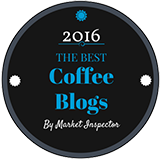 Are Keurig K-Cup brewers available at your local supermarket? Keurig brewers in the supermarket. I live in Montreal, and have had my Keurig B60 for over two years now. 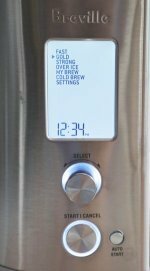 I bought the brewer online from the U.S. And for a while I had to buy my K-Cups online too. Then about a year or so back my local supermarket started stocking K-Cups. But not the brewers. Although I soon saw Keurig brewers appearing in specialty kitchen stores, they didn’t seem to be hitting mass distribution. Then this morning I was at my usual supermarket – where I buy my K-Cups – and wonder upon wonders...a whole display of Keurig brewers, as you can see in the photo above. How about you? 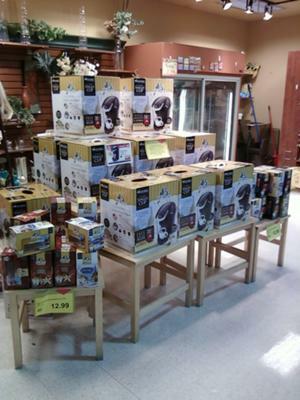 Do you see Keurig K-Cup brewers for sale in regular supermarkets? Or have you seen them only in specialty stores? Or not at all? 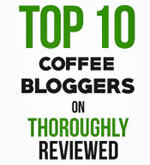 Comments for Are Keurig K-Cup brewers available at your local supermarket? I have seen the keurig system at many different places locally. It is amazing to see how single serve coffee has caught on. With uptick of single serve there is a huge market for the keurig machine. Keurig k-cups are amazing because there are so many flavors that virtually anyone will be satisfied with a flavor. Keurig has probably the best brands as well in the single serve business with the likes of dunkin donuts and starbucks part of the lineup to name a few. I really really like the cups and think they are one of the coolest things. Return to Single serve coffee makers.